The Scottish Government has dropped proposals to replace the council tax with a 3p local income tax. The plan - one of the SNP's highest-profile policies - had failed to win enough support in parliament. Opposition MSPs seized on the announcement, saying the policy was now totally discredited. Finance Secretary John Swinney told MSPs the legislation to bring in local income tax would not be introduced until after the next Scottish election. He admitted there was not enough parliamentary support for the plan. But Mr Swinney also said the UK government efficiency savings drive, which he said would take £500m off the Scottish budget, would make the proposals difficult to bring in. The Scottish Government said local income tax - a key pledge in the manifesto which won the SNP the 2007 election - was fairer than council tax, as it was based on ability to pay. Labour finance spokesman Andy Kerr said the governemnt decision was the "biggest retreat in the history of the parliament" and claimed the Nationalists had been "elected on a false prospectus". "I am pleased for the hard-working families of Scotland who won't have to pay this ludicrous tax," added Mr Kerr, whose party said it would make Scotland the highest-taxed part of the country. "They made a promise to the people of Scotland they were going to abolish the council tax, they know their proposals are nonsense and therefore they have simply retreated on that basis." Mr Swinney insisted local income tax, which ministers had wanted to introduce in 2011-12, would still leave two-thirds of Scots better off, and less than two out of 10 people at the top of the income scale paying "a little more". But he added: "It would not be wise and, indeed, it would not be possible to introduce a tax reduction of the scale we propose in the face of such swingeing Westminster cuts." The Tories said the wealthy who did not live off earned income would escape local income tax. The party's finance spokesman, Derek Brownlee, said the policy was "very, very flawed", and called for immediate talks about reforming the council tax. "We are perfectly happy to discuss reform of the council tax and I would now hope the government would now be receptive to such discussions, which would be in the broader national interests," he said. "We do not accept the status quo is the right option." The announcement came as the Scottish Government said it was providing cash to freeze council tax for the second year in a row and extend the policy to 2011-12. Mr Swinney said Scotland's 32 councils would be given more than £11.8bn of funding in 2009-10, an increase of £658m on the comparable sums for the previous year. The Lib Dems, who support local income tax, refused to back the Scottish Government's plan because the tax level would have been set centrally rather than by local authorities. 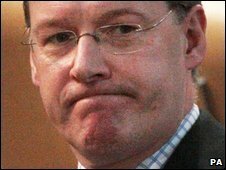 Jeremy Purvis, the Liberal Democrat finance spokesman said the "perpetual freezing" of the council tax now seemed to be adopted SNP policy. "It is a scandal," he said, adding: "As council tax is not progressive, nor is the perpetual freezing of council tax." Explaining the decision, Mr Swinney said: "The parliamentary arithmetic means that, while we might get the support of the Liberal Democrats for our proposals to introduce a local income tax, the Labour and Conservative parties are united in their opposition. "In short, we cannot put together a stable majority to enable us successfully to steer detailed local income tax legislation through this parliament." The finance secretary went on: "The cabinet has therefore decided not to introduce legislation to abolish unfair council tax and replace it with local income tax until after the election in 2011." The local income tax proposals also ran into trouble with the UK government, which refused to allow Scottish ministers to retain the £400m-a-year in council tax benefits paid to Scotland if the charge was scrapped. UK revenue bosses also gave a frosty response to suggestions they could run the collection of Scotland's planned local income tax. HM Revenue and Customs told BBC Scotland it operated a central tax system, not a local one.